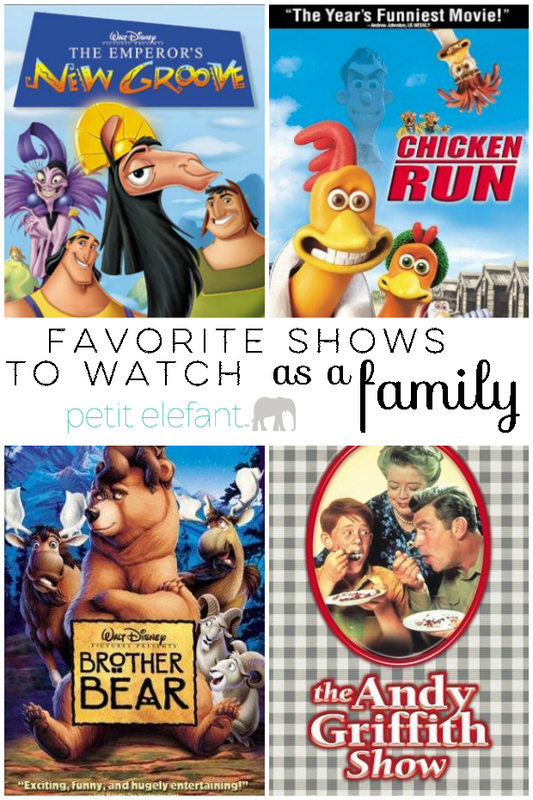 What are your favorite shows to watch as a family? We have quite a few, actually. In fact, we’ve started instituting Family Movie Night every Sunday night after dinner. I make a big, special dinner (including homemade dinner rolls) topped off with a tasty dessert like chocolate cake, or homemade apple pie with ice cream (that’s what we had last Sunday). The idea is to make family time that’s separate and more special than the hurry-up-crazy we push through the of the rest of the week, and it’s so much fun. We have a lot of favorite shows as a family, but we’re trying to branch out, watching something new every week. Right now we’re working our way through the Disney classics, many of which my youngest has never seen. Crazy! Hilarious movie about a selfish emperor and his royal sidekicks on adventures through the kingdom as the emperor learns to be more kind. Loosely based on the plot of the WWII movie The Great Escape, but with chickens. British chickens, trying to break out of the farmyard. This one is doubly a family favorite (owning chickens makes it extra funny). The story of a young hunter turned into bear after an unnecessary hunting kill, and the evolution of his respect towards nature as he tries to turn back into his human self. A classic TV show from way back when (1960) about a small town Sheriff and his son (played by the adorable Ron Howard as a child, before he became a big shot director) and their small town adventures. It’s such a slow, sweet, innocent TV show. We love watching it for a nice change of pace. 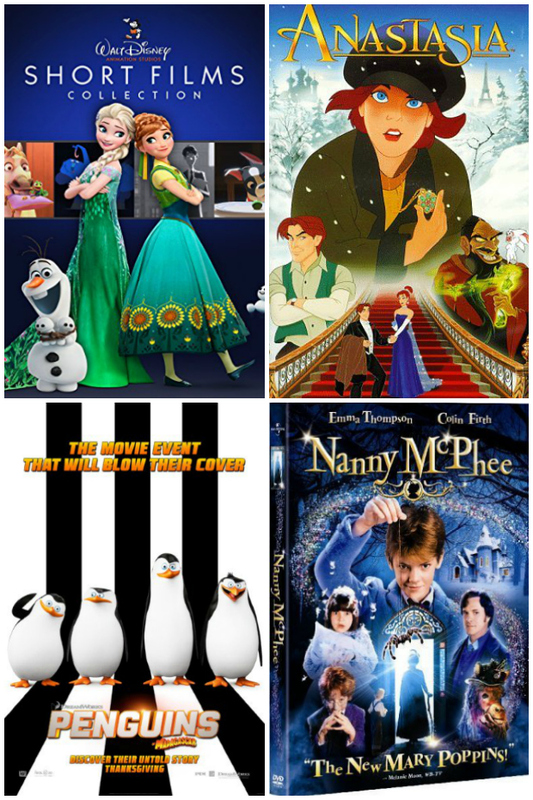 A collection of short films by Disney, all of which will make you happy, at least one of which will make you cry. So darling, perfect for a quick Disney fix, extra perfect for smaller kids with shorter attention spans and early bedtimes. The (fictional) story of the demise of the last Tsars or Russia, and their only remaining relative, the last Tsarina of Russia, Anastasia. It’s a cute, very safe peek at the end of the Russian Empire at the beginning of the 20th century. My family is a little teensy bit obsessed with the Penguins from the Madagascar movies, so when they made a Penguins movie just for our favorite characters? We almost plotzed. The military-lingo coming out of cartoon penguin mouths as they try to save the world from utter destruction is enough to make anyone’s whole weekend. A family of darling but very naughty, unsupervised children whose mother has died, as they come under the rule of a new nanny, nanny McPhee, who runs the house on love and magic. Their evolution from sad, wily kids to happy, well behaved children gives us all hope our parenting will work out in the end. OK, that was maybe a little introspective, but the movie is the best. Very feel good, and totally funny. If we had to pick a favorite movie for our whole family, out of everything, Waking Ned Devine would win, hands down. It’s a sort of under-the-radar movie about a small isolated Irish town and the stories of the people within it after one of them has won a huge lottery. My whole family laughs outrageously loud and then cries in turn through the whole movie. MUST SEE. This is a TV series (2009-2014) about the story of the very handsome, double charming, conman Nick Caffrey who joins the FBI to catch white collar criminals in N.Y.C. It’s extra light, formulaic fun for the whole family. For fans of Rowan Atkinson (of Mr. Bean fame) and his famed whole body, slapstick humor, is the story of Johnny English, an incompetent spy for Britain’s MI5. Laugh-out-loud silly, and lots of fun. The remarkable behind-the-scenes story of groundbreaking Olympic gymnast Gabby Douglas, the first African American to be named as an Individual All-Around Champion, at the 2012 Olympic Games in London. Very cool inspirational story for everyone, especially kids dreaming big dreams against all odds. There you go! 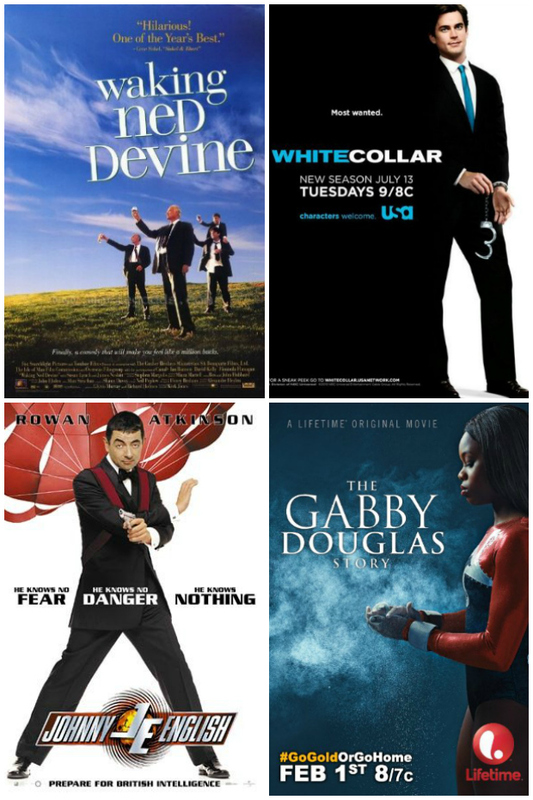 12 of our favorite shows to watch as a family at the Czarnecki house. What would you add to the list? Waking Ned Devine is THE BEST MOVIE! It’s my family’s movie too. We all die laughing. Isn’t it the best Rikki? A total hidden gem! We LOVE it. Carol, Emperor’s New Groove is hilarious! I love it when there’s funny stuff tucked in that only the adults get. I haven’t seen The Tuxedo, I’ll have to look into it, thank you!